„ბასტილიის აღება“, ჟან-პიერ-ლუი-ლორან ჰუელის ნახატი. ბასტილიის შტურმი 1789 წლის 14 ივლისს მნიშვნელოვანი სიმბოლური ეტაპი იყო საფრანგეთის რევოლუციაში. მიუხედავად იმისა, რომ ამ დროისთვის ბასტილიის ციხეში მხოლოდ შვიდი ტუსაღი იმყოფებოდა, ეს აქტი გახდა მეფის წინააღმდეგ ღია აჯანყების დასაწყისის სულისჩამდგმელი. ამ მოვლენის პირველი წლისთავი აღნიშნული იყო, როგორც Fête de la Fédération (ფედერაციის დღესასწაული). ამჟამად 14 ივლისი საფრანგეთის ეროვნული დღესასწაულია და მას ასევე ”ბასტილიის დღეს” უწოდებენ. Lüsebrink, Hans-Jürgen; Reichardt, Rolf; Schürer, Norbert (1997). The Bastille. Duke University Press. ISBN 978-0-8223-1894-1. Mignet, Francois-Auguste (1 January 2006). History of the French Revolution from 1789 to 1814. Taylor, David (1997). The French Revolution. Heinemann, გვ. 16–17. ISBN 978-0-435-31694-5. Stephens, Henry Morse (1886). A History of the French Revolution. C. Scribner's sons, გვ. 128–168. Abbott, John Stevens Cabot (1887). 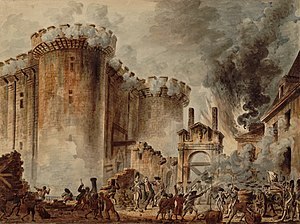 The French Revolution of 1789 as Viewed in the Light of Republican Institutions. Jefferson Press, გვ. 112–122. ეს გვერდი ბოლოს დარედაქტირდა: 14:50, 20 დეკემბერი 2017.